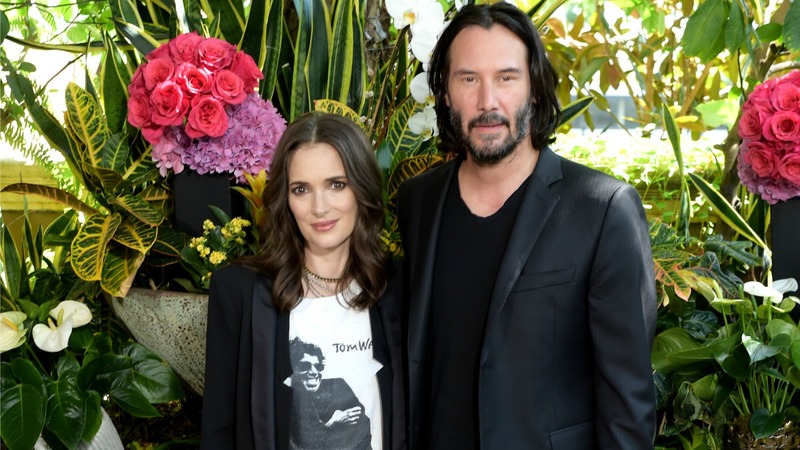 Wait, Are Winona Ryder & Keanu Reeves Really Married? What the world needs right now is a new power couple to love, and we vote for Winona Ryder and Keanu Reeves. Are they together romantically? Nope. But are they possibly also married? That’s the latest scoop, according to Ryder — in an interview with Entertainment Weekly, the Stranger Things star confessed that she and Reeves may have accidentally gotten hitched back in the ’90s. We’ll give that a minute to sink in. So, here’s what we know about this blessed pseudo-union. In 1992, Ryder and Reeves costarred in Bram Stoker’s Dracula, as you may remember. When the subject of marriage came up on Saturday during a press interview with EW for the pair’s upcoming rom-com, Destination Wedding, Ryder flashed back to a very specific memory from the set of the costars’ early ’90s gothic endeavor. More: Winona Ryder Admits Being a Pop Culture Icon Again Is "So Overwhelming"
The on-screen marriage is easy enough to confirm for anyone who can see the movie. Still, Ryder’s statement necessitated more information — which she readily offered. “In that scene, Francis [Ford Coppola, director] used a real Romanian priest. We shot the master and he did the whole thing. So I think we’re married,” Ryder elaborated. At this point, Reeves gave ’90s kids the happy ending we deserve by acquiescing. “Oh my gosh, we’re married,” he said to Ryder. Praise be to the Romanian priest responsible for this delightful revelation! In real life, Ryder has reportedly been dating fashion designer Scott Mackinlay Hahn since 2011, while Reeves isn’t currently romantically linked to anyone. So, we might not get a legitimate Ryder-Reeves wedding (outside of Romania). However, we do get to catch the two of them together again on-screen in Destination Wedding, out Aug. 31. In the rom-com, Ryder and Reeves play characters on their way to a destination wedding who realize neither one really wants to go. Despite their individual social awkwardness, pessimism and general dislike of each other, they begin to fall in love as the weekend progresses. And although Reeves didn’t quite remember the costars’ Romanian vows, he was quick to point out that they do make a pretty great team.